In my first post about building this road, I described the East Shumala location and showed my basic construction method using sheet styrene (see it at: http://modelingthesp.blogspot.com/2014/12/pismo-dunes-road-east-shumala.html ) . This road is important to development of the entire East Shumala section of the layout, because it sets the front of the scenery area. With the styrene road shape complete, as shown in that prior post, the next step was to put a coat of primer on the styrene. I plan to use acrylic tube paints to color the road, but as these are water-based, they don’t work well on clean styrene, so a quick rattle-can primer of a dark gray color was used. My paint for this was Tamiya TS-48, “Gunship Grey,” a color I use for lots of background dark colors. I simply spread some newspaper on the garage floor and painted. Here is the road section with this done. Coverage isn’t perfect, but this is just primer. At that point, I also needed to refine the road shape a little bit, to blend better into the layout area where it would be placed. There is always an issue with roads which meet the backdrop, in that it is a challenge to blend the scenery and make the road not look like it crashes into a wall. At the left end of the section you see above, the road would have done just that. I simply added a partial curve at that point. With the roadway piece fitting well onto the layout, I glued it down with canopy glue, which I’ve found to be an excellent adhesive to attach dissimilar materials like these. (You can read my comments about canopy glue at: http://modelingthesp.blogspot.com/2013/05/a-few-words-in-praise-of-canopy-glue.html .) Weights were placed on the roadway while the glue set, to ensure a good bond. Once this was done, I used my customary fine-grained paper mache product, Brandt’s Paper Mache Compound (Brandt’s, a taxidermists’ product, is available from Robert Ruozzi of Irwin, PA) to fill any gaps on the aisle side, and to form the contours of the road shoulder. As you can see, I use an ordinary putty knife for this, and keep a plain kitchen sponge handy to wipe clean both the fascia and the road surface as I work. The paper mache was mixed in the background bowl. Note I also filled along the fascia edge, which will be painted a color to match the Masonite, and to bring the vertical surface right up to the plane of the roadway. Here is a view of the entire area. The gap between Caslon Printing, at left, and Phelan & Taylor, the white packing house at center, is where Alder Street will be located. I have left a gap in the road shoulder at that approximate location, pending choice of exact alignment. I am working on a stock pen to be placed between the tracks and Pismo Dunes Road. 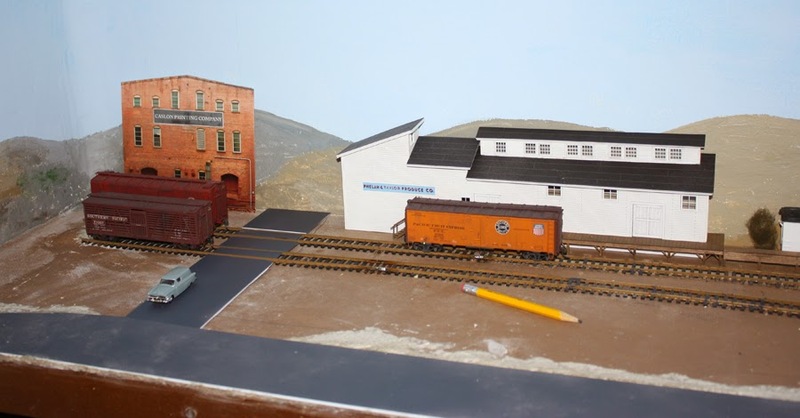 Many stock pens along the SP were owned and operated by the railroad, which is how I will portray this one. Last task for this phase of the project is to get Alder Street started. 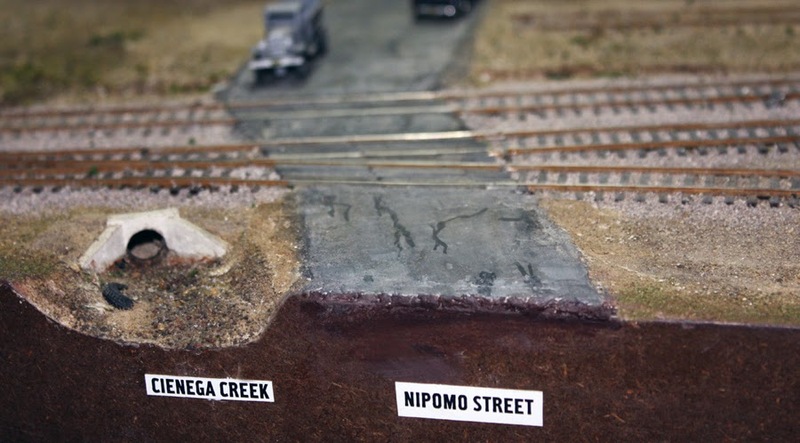 I used the same 1/16-inch styrene sheet that Pismo Dunes Road was made from, and cut out the pieces to fit around the grade crossings of the two spur tracks. These styrene pieces were also primed with the Tamiya Gunship Grey paint. Here are the primed pieces, merely set in place. But there are a couple of problems here. First, the road slams straight into the wall, a hard arrangement to disguise or hide. Second, the full-width roadway doesn’t quite look right. What to do? It would be easy to taper the roadway to force some perspective, but that won’t help with the perpendicular arrival at the wall. Something else has to be done, and I will take that up in the next post. Also in my next phase of this project, I will refine all the road shoulders, and paint the road, followed by application of a center line to Pismo Dunes Road. I will also carve a suggestion of drainage ditches along one side. 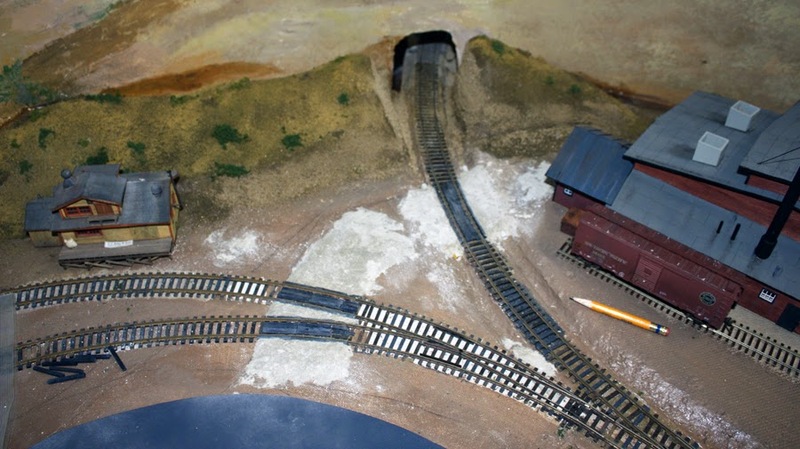 Modelers are accustomed to the fact that rail lines are accompanied by drainage ditches, but seem not to recognize that roads, especially in the country, often have them too. But I’ll postpone describing those steps to a future post. Many of us, certainly including me, tend to focus so much on individual freight cars that we can lose sight of the “big picture,” by which I mean the overall character of the fleet of freight cars. It’s the kind of thing you form an impression of, as soon as you walk into a layout room on a visit. The impression I mean is whether everything you see, specifically including the freight cars, “looks right.” What does that mean? It mostly means “era consistent,” but it also means that there are not too many “circus” or “billboard” cars, even for the 1920s, and that the balance of car types is reasonable. It may also mean car color, and that’s the sub-topic of this post. Now I have to quickly issue a disclaimer. A fair amount of Rick’s article, fully a third of it, is a simplistic, dated, and in places simply wrong summary of what prototypes were represented by the models of the day. 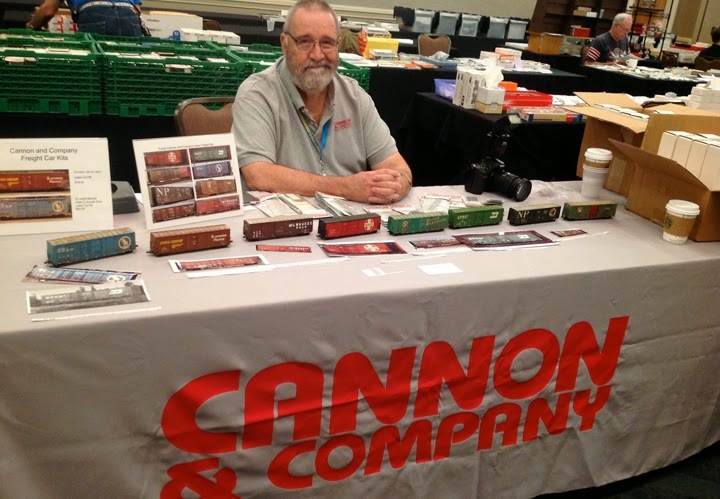 For example, for box cars he discussed Athearn MDC, and Train Miniature. With the immensely better models of today, practically all of that discussion is moot, and as I said, riddled with oversimplifications and errors. But the attraction for me, then and now, is his discussion of the impression you make with your fleet of freight cars. This part occupies about a fourth of the article. Here, Tipton emphasizes that black and boxcar red freight cars tend to be more “anonymous” in a train than cars of other colors (and of course yellow and orange reefers also qualify). In fact, his point was that trains of anonymous cars tend to look longer, a big plus on almost any layout, because you don’t perceive the train as separate cars, or notice the unusual or bright-colored ones. This is something you can readily see for yourself on any layout you visit. Of course, plain colors, and lots of them, among your freight cars is entirely prototypical for the transition era, but Rick’s point is that there is a further benefit, the anonymity of such cars in trains. Weathering further enhances this effect, both in dulling lettering and heralds, and also in making cars look more alike. Creating the impression that trains are longer is obviously a plus, and the fact that a viewer doesn’t focus on a vivid paint scheme, but instead perceives each car as simply a player in the scene, also appeals to me. I can’t claim to faithfully follow what Rick suggested, but I certainly lean in that direction. Here is a photo of Ten-wheeler 2344 switching at Shumala, which I think illustrates the general point. The “hole” in the fascia at right is a recessed push-pull control for a turnout. The key phrase which Rick used is, “cars should be seen, not counted,” and of course he means that in terms of their overall impression on the layout. It’s a good observation and one I still keep in mind, more than 35 years since the article was printed. Awhile back I introduced the topic of modeling the “Coast Mail” train which operated on SP’s Coast Line. You can read that introductory post at: http://modelingthesp.blogspot.com/2012/10/choosing-model-sp-passenger-cars.html . The train wasn’t officially called the “Coast Mail;” the real name of the train was pretty dull, just “Passenger” in the timetable, but it was widely known in the 1950s as the Coast Mail. In the present post I discuss the express reefers that sometime ran in the train. I know from my presentations over the years, when I describe Pacific Fruit Express operations, that many people have misconceptions about express refrigerator cars and how they are operated. Some folks are also confused about what they are used for. This post is intended to clarify those points. The answers on these points do depend on era. Before 1920, there were relatively few reefers specially built and equipped for service in passenger trains (which is the core of the ARA and AAR definitions of what an express refrigerator is). If equipped with ice bunkers, the commonest arrangement, these cars were classified as BR. Any freight refrigerator could be equipped for passenger service (and that was the usual procedure before 1920), but specially built cars became the norm for this service in the 1920s. In 1918, the four big express companies, Wells Fargo, Adams Express, American Express, and Southern Express, were combined into a single entity, American Railway Express, and many newly built BR cars were lettered for ARE, just as were baggage cars which carried express. But ARE remained a private company. In 1929, 86 railroads combined assets to purchase all the assets of ARE and create a new agency, the Railway Express Agency or REA, which was owned by the railroads. Its reporting marks were REX. Railroad baggage cars were soon relettered for REA if in express service. Express reefers, previously leased to ARE by railroads and continued under lease to REA, largely were released back to their owners in the 1930s as leases expired. But REA continued to direct operation of these cars, through a pool of express cars. This pool varied over the years, but typically most railroads (and PFE) did place their BR cars into pool service. This meant that REA directed operation of the cars. If a shipper needed a BR car to load, he did so through REA, not through PFE or his local railroad, though the railroad’s local agent would have handled express matters in addition to railroad matters. The cars remained in their original ownership (railroad or PFE), and the owners were responsible for all but minor running repairs. Financially, freight charges paid by shippers (or consignees) included a fee to REA along with mileage payments for use of the cars; the latter went to the owners, and all icing fees went to the providers of the service. The pools meant that any car in the pool could, in principle, be assigned anywhere in the country it was needed. A Santa Fe car could be loaded in Boston, a Seaboard car in Seattle, or a PFE car in Florida. But the maintenance needs of the cars meant that most of the time, they operated approximately in their home territory. Below is a list of the participants in the REA pool in 1953. 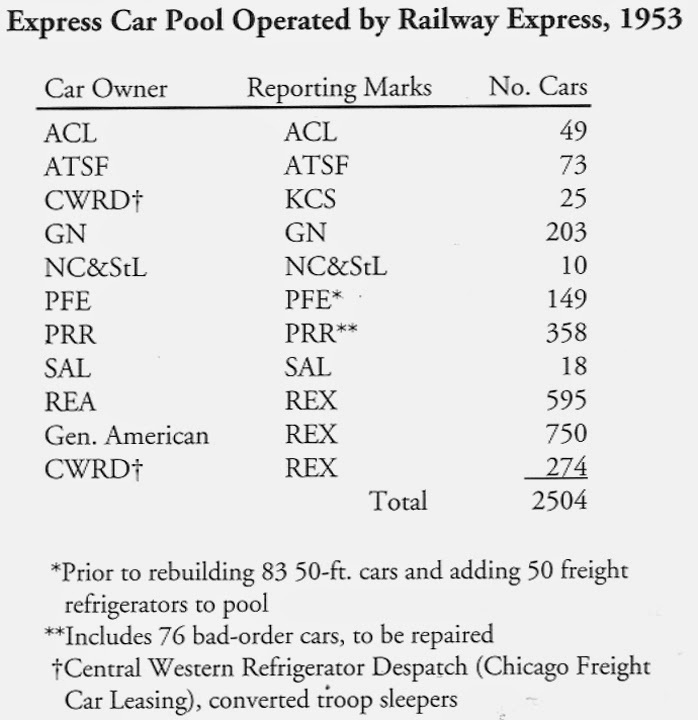 Of the 2500-some cars in the pool, over 1600 were REX-marked cars, with a number of railroads also participating, along with PFE and also a leasing company, Chicago Freight Car Leasing, which contributed converted troop sleepers made into express reefers. Note that several member railroads of Fruit Growers Express (PRR, SAL, ACL, NC&StL, GN) all had contributed express cars to this pool. This table, by the way, is Table 5-4 from the PFE book, page 101 (Pacific Fruit Express, 2nd edition, Thompson, Church and Jones, Signature Press, 2000). How should model operations reflect these details? As stated above, it was possible that pool cars from anywhere could show up in a particular location — an ACL car might be loaded in California — but more typically California BR loadings would take place in PFE or ATSF cars, and of course in REX cars. 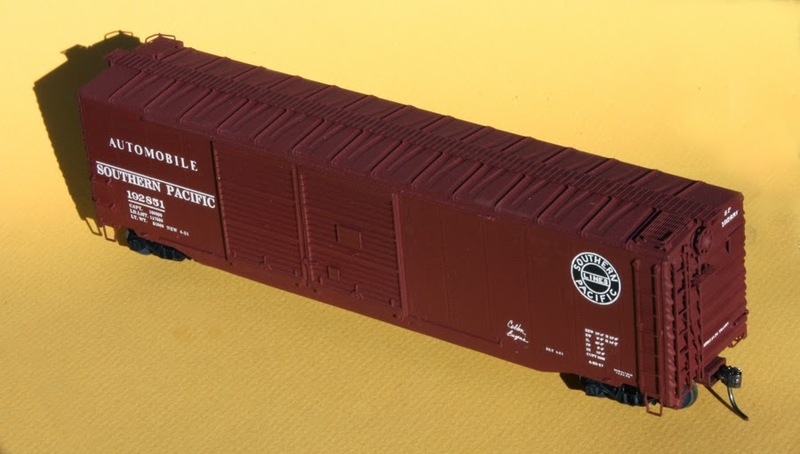 As most modelers know, express reefers were used for cargo which needed extremely rapid delivery, or was of especially high value, or both. One obvious cargo of that type is the first harvest of any season, whether cantaloupes, cherries, or other fruit, or something like the first salmon of the year. On the SP, cut flowers were shipped from California to the Midwest during much of the year in express reefers. 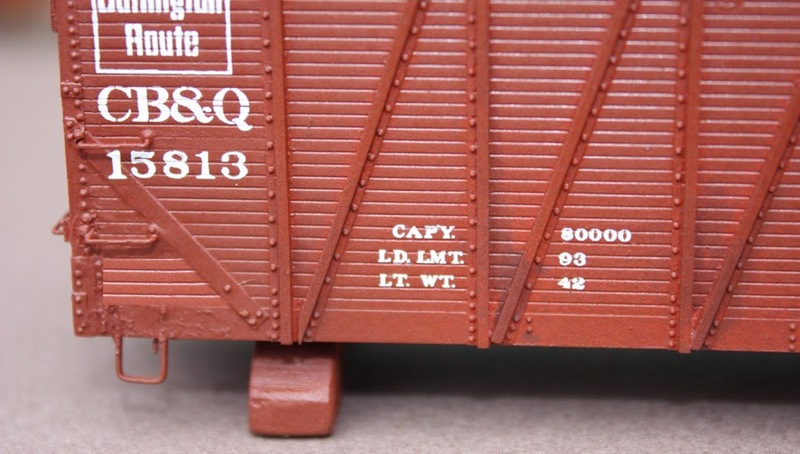 Modelers can devise cargoes to fit these categories. My own car fleet contains mostly PFE express cars, but I do have a few non-PFE cars, which I operate sparingly. I have one REX car, which is Walthers’ version of the essentially standard car built by General American for many buyers in the 1920s. 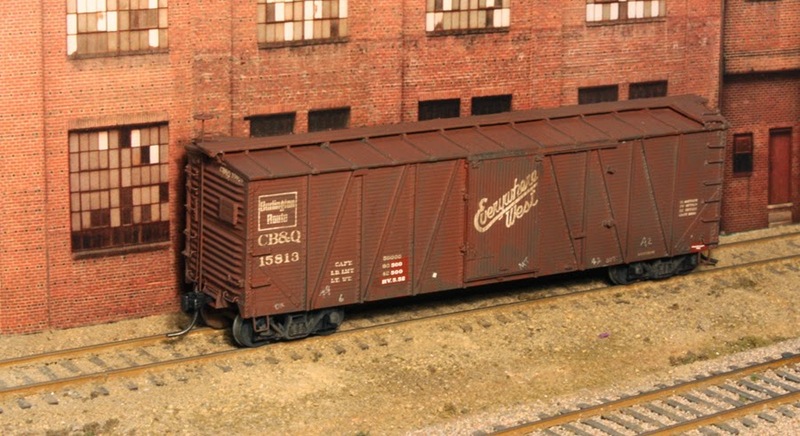 I also have an old Ambroid kit, one of my first kit-built freight cars, for a GN express reefer, and both Milwaukee and NP express reefers (note that neither was in the REA pool). For really faraway owners, I also have a brass car from NJ International for New York Central (also not an REA pool participant). Its deep side sills make it a distinctive car. Here is an example of an REX car being loaded at my Phelan & Taylor packing house in East Shumala. This is the Walthers model. And similarly, here is PFE 799, recently rebuilt without the top fascia board and thus freshly repainted, shown being picked up at Coastal Citrus in Santa Rosalia. The car is a brass import from WP Car Company. What’s this about a PFE rebuild, you may ask. In the PFE book (reference citation above), it’s explained that these cars were built without ice hatch platforms, but received them in the early 1930s. That was about the only visible change until the 1950s, when the cars were approaching 30 years in service, which is a long time for cars with wood superstructure framing. In late 1953, rebuilding began on 83 of the cars, which received steel superstructure frames and, incidentally, new side fascia boards which were very narrow (see photo above). But most PFE express cars at that time were older cars, some fairly deteriorated. 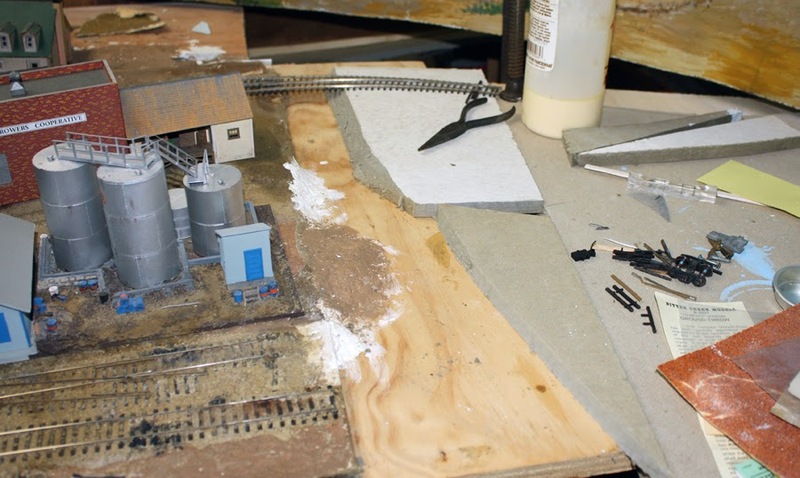 I have one model with that appearance, shown here at the head end of an eastward Coast Mail on my layout. 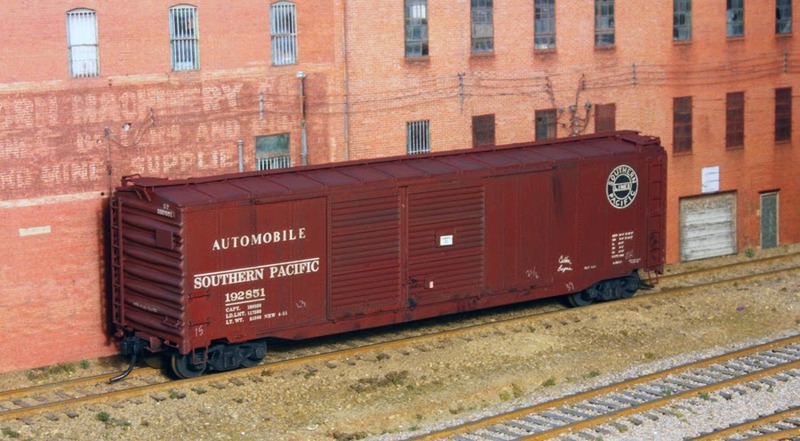 The model is an upgraded Athearn express reefer, with new sill steps, ice hatch platforms, and brake gear. I only occasionally have car requests from my packing houses for express reefers, but they make a nice change when they are needed. 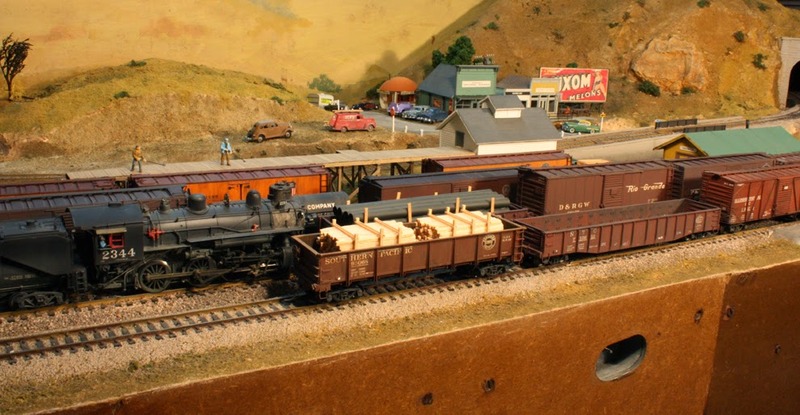 I introduced this project with a presentation of the prototype background, and an explanation of what had to be accomplished to model these cars (see: http://modelingthesp.blogspot.com/2014/12/modeling-southern-pacific-class-50-17.html ). The modeling challenge is primarily the placement of a correct side sheet pattern and associated double-row rivets. I introduced the first phase of the modeling work, with removal of the side rivets of the Branchline Trains 50-foot body, culminating in a gray “witness coat” over the clean car sides. This was shown in my previous post at: http://modelingthesp.blogspot.com/2015/01/modeling-sp-class-50-17-modeling.html . My article in the Southern Pacific Historical & Technical Society magazine Trainline has now appeared, and like all back issues in print, can be purchased from the Society. Issue 122, Winter 2015, is not yet for sale but will appear soon at this link: http://www.sphtsstore.org/servlet/the-Trainline-back-issues/Categories . That said, I will conclude my modeling description, having a bit more space here than in the magazine for both more text and more photos. The blog posts were separately written and do not duplicate the magazine article, but of course cover the same topic. In the modeling, I was now ready to create the new car sides. The first step was to measure the car on both sides of the door opening, and divide each of the two spaces evenly into four (left) and six (right of the doors) panels. These sizes are close to the three and a half feet per panel. I used an ordinary scriber, and a small machinist’s square, to make these panel lines. Care to get these straight, and perpendicular to the floor, is worth some extra effort. Once these lines were complete, I could proceed with rivet application. As explained in my first post (link at the top of this post), the double rivet rows are easy to accomplish because the Archer Transfers set AR88108 has exactly the right rivet spacings for this application. In fact, I researched what was needed, and provided the data to Archer in order to do the present project! To purchase this rivet set, you can go to: http://www.archertransfers.com/AR88108.html . Here is where the gray witness coat comes in handy, because the rivets are black, and on a light background are easy to align parallel to the panel lines. I did apply Testors Glosscote over the gray to ensure a good surface for applying decals. Here is a completed car side with these decals in place. You can click to enlarge. Note that the wider-spaced rivet rows are on the side of the seam away from the door opening, on each side of the opening. Once all decals are applied, I added a light coating of Dullcote to protect the rivets. They are not really delicate, but can be knocked off by an inadvertent encounter with a tool or fingernail. A layer of Dullcote seems to keep them safe. Next I simply completed assembly of the Branchline kit, following kit directions, and as there is nothing out of the ordinary in that process, I will say no more. The only changes I made were to install an etched-metal running board and brake step (Plano no. 194) instead of the molded plastic one in the kit, to represent the prototype’s Apex running board and step, and added a Ureco brake wheel. 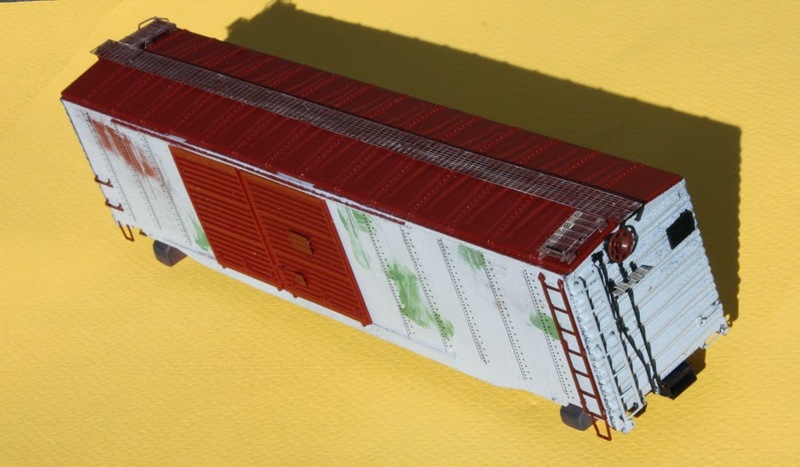 Here is the model, ready to paint, resting on truck support blocks (if you don’t know these, you may wish to read: http://modelingthesp.blogspot.com/2014/11/interim-truck-support-blocks.html ). At this point, I airbrushed the model with Floquil “D&H Caboose Red,” a color which is a good match to the SP freight car color after World War II. I have a good stash of this paint, though it is no longer commercially available, but as with any model color, if you plan to add much weathering to your model, the exact color will not be too important. Next comes lettering. There is no set I am aware of, which can do all the lettering on this car. I used a few elements from a Sunshine Models data set, some data from the Funaro & Camerlengo set for their Class A-50-6 automobile car (I believe the set is still available direct from F&C), and parts of the fine Speedwitch Media decal set D114. The Speedwitch decals can be purchased on-line at: http://speedwitchmedia.com/decals/ . All lettering was intended to match prototype size and location, from photos like the one shown in the Background part of this thread, and in most cases that was accomplished. Finally, I installed Kadee #58 couplers, added semi-scale wheelsets to the trucks, and attached both trucks and couplers with 2-56 screws. The lettered but unweathered model is shown below. Note that the car has no white door stripe, unlike the prototype photos shown in the Background post. Those stripes denoted the presence of auto racks, and I am modeling a car without racks. In my model year of 1953, this car class was barely two years old, so would not be very dirty. I weathered it lightly with my usual acrylic washes, and added route cards, a placard for auto parts, and a few chalk marks. Here it is on my layout. This was an interesting project for me, in changing the side-sheet pattern and rivets to match an SP prototype. I will be the first to admit that the changes are far from striking on the finished model, but rest assured that I know about them. As I do almost every year, I traveled a week ago to Cocoa Beach, Florida, for the outstanding “Prototype Rails” meeting organized by Mike Brock. Mike has a tremendous crew behind him, from Jeff Aley who runs the program, to Marty Megregian, Scott Dam, and others who help with arrangements. The experience of this crew is obvious: the meetings are well planned and run smoothly. This year was no exception. The clinic program was very good. 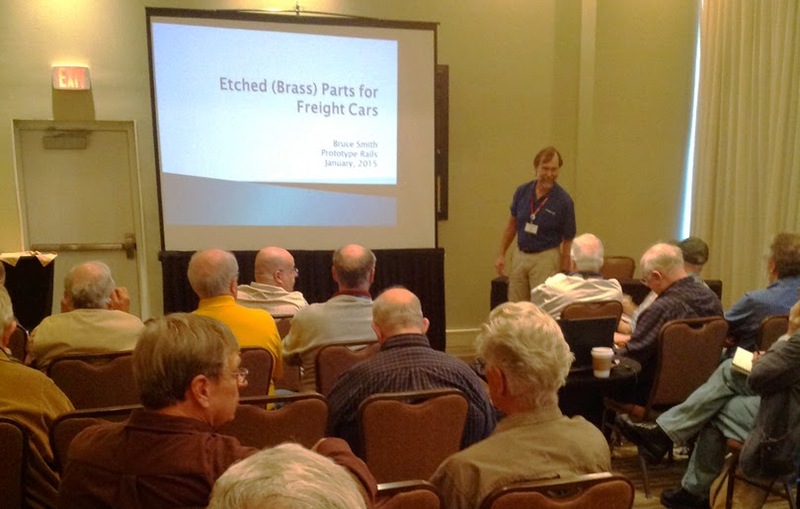 I will just show a photo from one of the many talks I enjoyed and learned from, Bruce Smith’s presentation on etching brass parts. That’s Bruce at upper right alongside the screen, about to begin his talk. There are always a good assortment of vendors at the meeting, many of them the specialized people we don’t readily see otherwise, from Funaro & Camerlengo, Motrak, and Speedwitch Media, to Cannon & Company, with Dave Hussey behind the table. A high point for many attendees is the huge model display. Many folks just bring the models and lay them out on the table, but others provide detailed descriptions of how the model was built, parts and decals used, etc., and often the prototype photos used for reference in the project. These are truly learning moments, and I find the partly completed models the most informative, because you can see clearly what the modeler was doing. 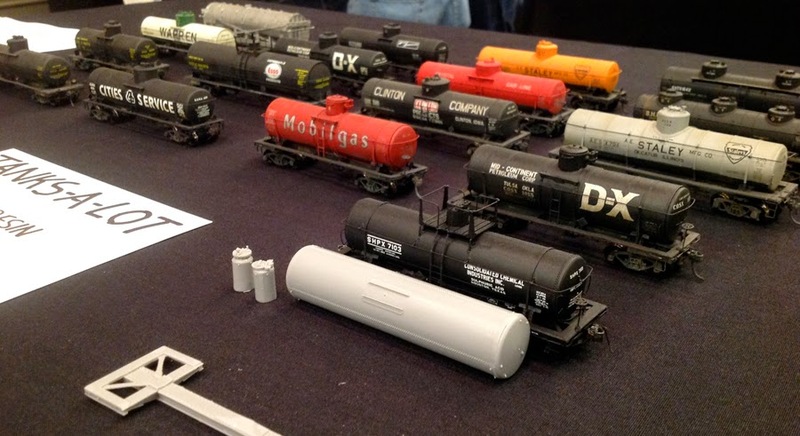 Bill Darnaby brought an absolute fleet of tank cars. He also included two of the forthcoming acid tank cars from Frank Hodina’s new Resin Car Works, both completed cars and a sample of the kit parts (foreground). All the tank cars were excellent and a pleasure to see. 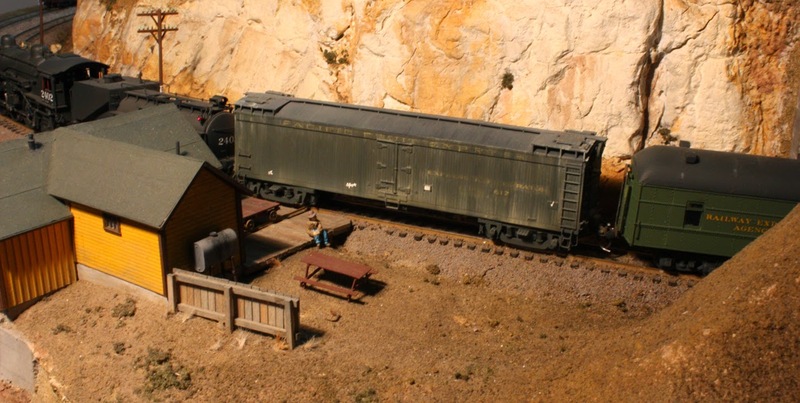 Another striking model exhibited was Marty Megregian’s O scale Union Pacific shop switcher, built by combining running gear, boiler and other parts acquired over a period of years, and building the cab and water tank. He provided a full written description of how the project was carried out, too. Really impressive. Being a freight car guy myself, I naturally gravitate to examination of those kinds of models in the display, but as usual, there were also some very nice structure models shown. 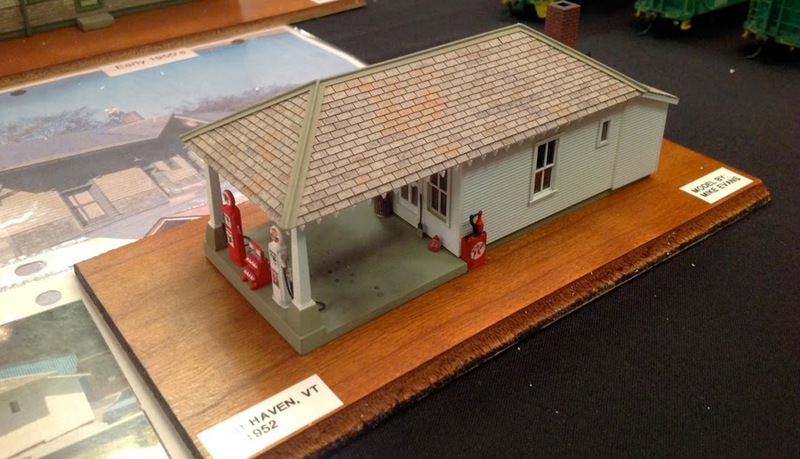 Jared Harper had a bunch of elegant components for stock pens, and Mike Evans showed a very neat vintage gas station. Lastly, here is just one example of someone (in this case, Al Brown) telling us all about how the model was built, and showing it unpainted. This model has plain styrene sides with Archer rivets, an Accurail underframe, ends and sidesill castings from Chad Boas, Red Caboose roof, doors and running board, and various parts from several sources, representing a rebuild of a USRA double-sheathed box car to be a Santa Fe Class Bx-31. (This is a variant version of one of the 2014 Shake ’n’ Take models.) Nice modeling, and an informative presentation. I continue to find real value and pleasure in attending this meeting, even though it takes place about as far from where I live as anywhere in the lower 48 states. I certainly plan to be there next year. My layout is like many model railroads, in that it probably has too few watercourses. But by way of justification, it does happen to be true that the area I am modeling, south of Oceano, California, is flat and sandy, and creeks tend to be small and to meander gently to the sea. (You can view my post about this area at: http://modelingthesp.blogspot.com/2012/11/visiting-area-you-model.html .) But both because waterways are part of the real world, and because when you include one, you get to build a railroad bridge too, I have striven to add them where I can. I will just emphasize at the outset that this particular creek is of no great significance, and I am only describing its construction to illustrate how one can go about planning and building any small waterway. The present subject is a small creek in my area, called Oso Flaco Creek. 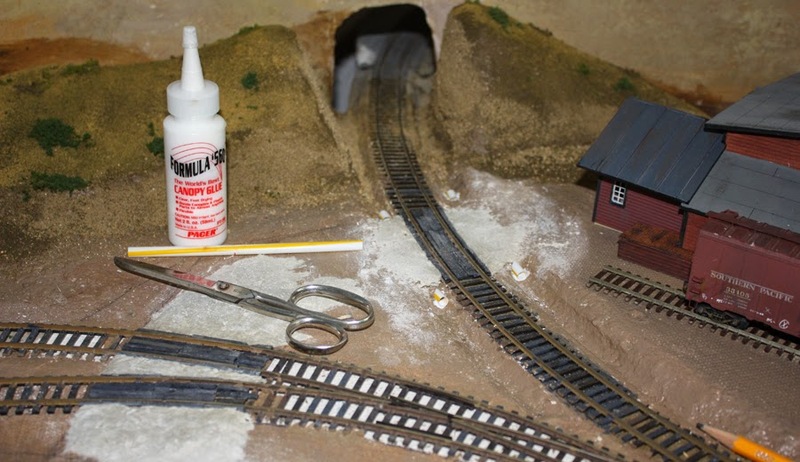 On my layout, it lies at the (railroad) east edge of the town of Ballard, which thus can have the useful quality of providing a scene divider from the next town on the branch, Santa Rosalia. My overall locale, including both these towns, has been discussed previously (if you’re interested, my general discussion of locale is at: http://modelingthesp.blogspot.com/2011/01/layout-design-locale.html ). Before going further, I should mention that anyone who has been attentively following this blog may recognize the name, Oso Flaco, because I had previously used that name for another creek on the layout (see for example: http://modelingthesp.blogspot.com/2013/03/layout-fascia-part-2-signage.html ), but subsequently I realized that the prototype Oso Flaco Creek is really further south, and the creek at the north (railroad west) end of Ballard is nearer to the prototype Cienaga Creek. My fascia signage at Ballard now reflects that change; you can compare the signage in the just-cited link. In Spanish, “ciénaga” means “marshy,” which is certainly the character of this creek as it nears the ocean, but not in my modeling area. One attraction for modeling Oso Flaco Creek is its thoroughly historic name. The Portolá exploring expedition in early California camped along this creek on September 2, 1769, and some of the soldiers killed a bear (they had seen troops of bears in the area earlier). They named it El Oso Flaco, which in Spanish means “the lean bear” (sometimes translated as “the skinny bear”). Subsequent Spanish manuscripts consistently used this name for the creek and the shallow lakes through which it flows to reach the sea. This is a good example of combining research into place names (for me, Erwin Gudde’s great book, California Place Names, University of California Press, 3rd edition, 1969 is an essential reference), with the detail which can be gleaned from U.S. Geographic Survey topographic maps. Of course, following the iron-clad rule of using USGS maps, which is that the area of interest invariably falls at the intersection of two, and sometimes three maps, I actually got lucky and only needed two, the Oceano and Guadalupe quadrangles. Now to the model. My track board for Ballard, with Homasote as the top member, simply was cut off short where the town ended. My first action here was to see how the space for this small creek looked, and to plan how it would be modeled. I started by placing some scrap Homasote pieces to make trial creek banks and, when this looked feasible, I placed a little Sculptamold to make a somewhat meandering course. Putting a little brown paint onto some of it helped visualize what I was starting to get. Here is an overhead view at this point. The bare plywood is the creek bottom. The Union Oil depot and, behind it, the Wine Growers Cooperative, are the industries here. The base of the backdrop, curving around to the right toward Santa Rosalia, is visible at the back of the image. The Homasote pieces temporarily defining the course of the creek are not glued down. The experimental start on a creek bank is visible too. More refinement is obviously needed, and I need to build a pile trestle for the railroad to cross the creek (a typical Southern Pacific bridge type in this situation). Since this creek is little more than a trickle during most of the year, I will model the bed of the creek as mostly stony and sandy, with a narrow thread of water in it. Also necessary is to plan how the creek “disappears” toward the backdrop. But I’ll take up those topics in a future post. 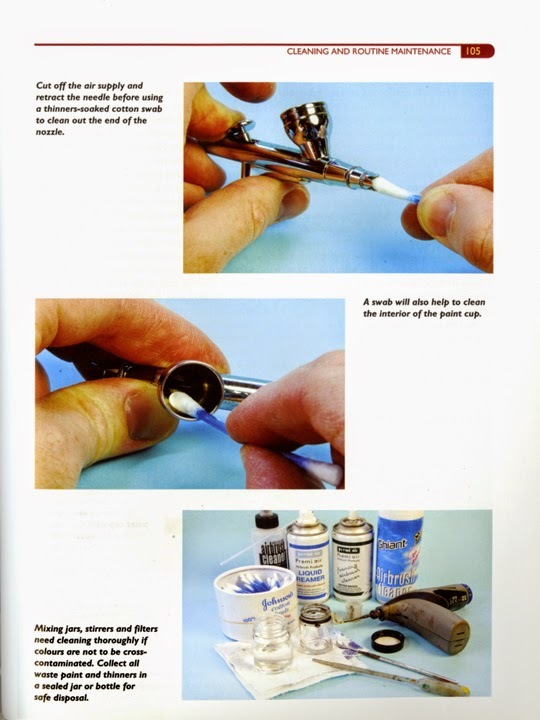 A few weeks back I posted a brief overview of the value of airbrush use, and recommended several instructional books which I think do a good job (you can read it at: http://modelingthesp.blogspot.com/2014/12/using-airbrush.html ). In a comment to that post, Colin ’t Hart gave strong support to a book by George Dent, which he felt does a great job too. It’s a 224-page book, 7.5 x 9.75-inch page size, very nicely printed and sturdily bound, all in all quite a good value for the price. What’s inside? 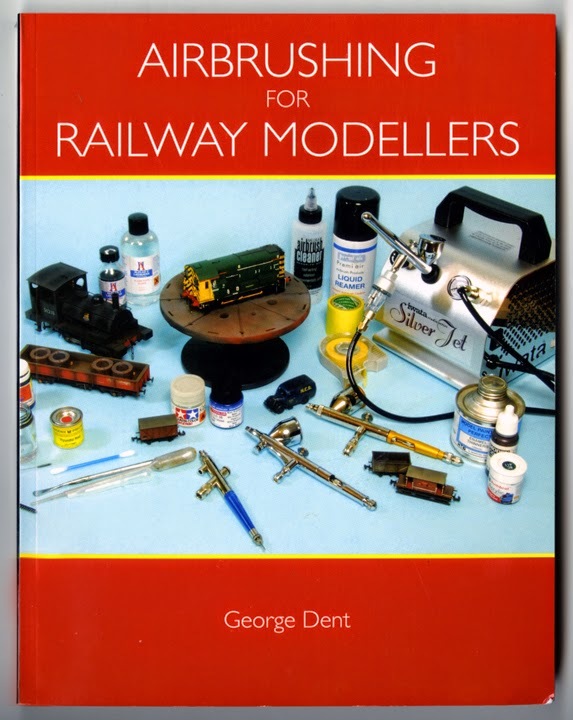 Like the fine book by Tim Shackleton I reviewed awhile back (read my review at: http://modelingthesp.blogspot.com/2014/11/an-excellent-book-on-weathering.html ), the examples are nearly all British outline models. But as with Tim’s book, the value is in the clear depiction of techniques and results. And I have to say this for Dent’s book: it is the most complete of any book like this I have seen, consistently clear, thorough, and sensible. I will just show a single interior page to illustrate what I like about the book. It is part of the chapter about cleaning the airbrush, and makes its point clearly. It’s not a coincidence that I chose the page above, because I want to add a couple of points in response to email questions I received. The gist of these queries was along the lines of, “what aspects would you primarily emphasize to a beginner?” My first point is that you must become unfailingly diligent about cleaning the airbrush every time it is used, even for clear finishes. Paint can linger in small passages in the brush and give you bad results next time, so do expect to spend those minutes after painting that are needed to clean up thoroughly. Make it a habit, and you will always get it done. But my second point is equally important. You simply have to experiment to see what works for your own style of painting. A revealing and instructive section of the Robert Downie book (How to Use an Airbrush, 2nd edition), which was reviewed in my first airbrush post, is a photo gallery at the back of the book, each model by a different modeler, complete with details of how each modeler got his results. You will see a variety of preferred airbrushes, air pressure values, paint types, practical advice, and so on. And these are skilled painters. You too need to find what works best for you, and you can only find out by trying different things. Dent’s book recommends that also. Don’t expect to simply read a formula for how to proceed, and then have immediate success. Thanks again to Colin ’t Hart for the comment he provided. I am really impressed with George Dent’s book, and heartily agree with Colin’s recommendation of it. I have previously posted some prototype background for this project, at: http://modelingthesp.blogspot.com/2014/12/modeling-southern-pacific-class-50-17.html ; now I want to turn to the modeling project itself. An overview of the modeling is presented in my article in the new Southern Pacific Historical & Technical Society publication Trainline, but I have space here to give details which wouldn’t fit in the magazine. 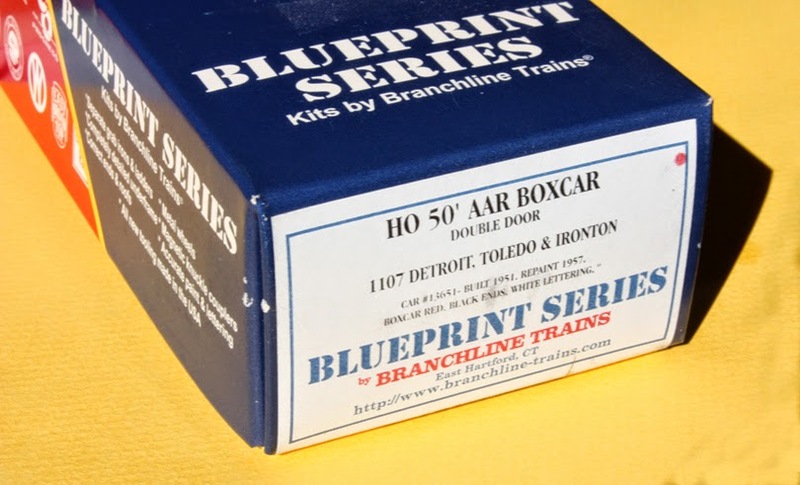 As I explained in the previous post, the major modeling challenge was to reproduce the SP’s pattern of side sheets on this class of automobile cars, which had four sheets to the left of the doors, six sheets to the right (written as “4-6”), while the closest HO scale model, the Branchline (now Atlas) automobile car, had a 5-8 pattern. Moreover, the SP cars had double rivet rows, the Branchline car single rows. The key is the availability of a recent decal set from Archer Transfers, set AR88108 (a photo of that set was shown in the “background” post). You can buy them direct from Archer Transfers at this URL: http://www.archertransfers.com/AR88108.html . My starting point was this kit, though the particular railroad shown was of no importance (I would of course repaint the completed model). If you could find an undecorated kit, that might be simpler. Here is the car body from the kit, and you can readily see (with the lighting used in this photo) the 5-8 pattern of side sheets. The strips of single rivets defining the sheet edges will need to be removed. Note also the gussets at the lower corners of the door opening. These were not on the SP cars, so these need to be removed also. You can click on the image to enlarge it. For shaving off rivet strips and comparable jobs, I always use a brand new blade in my X-acto knife, in this case a chisel blade. Here the single rivet rows are very evident. I used the same tool and method to remove the door-corner gussets, doing my best to retain the adjoining rivet rows, and also to remove the portion of the gusset below the door track. Once these shavings are complete, I sanded all areas that had been shaved with 600-grit abrasive paper to smooth out the surface. Usually I mess up in a few model areas and have to fill any gouges or other scars with modeling putty (I use Squadron Green). Here is the sanded and filled body. Here the 5-8 side sheet pattern of the original model is obvious. Once all the work to this point is satisfactory, I like to airbrush on a “witness coat” of light gray. This helps make obvious any remaining flaws, and a little more putty is usually needed to refine all areas and ensure a smooth car side at this point. And for this particular project, the light gray coat will be a big help when placing the Archer rivets, which are black. The gray also serves, of course, as primer. As is visible, I did need to re-putty a couple of areas of the body. Note that I also sprayed the car ends, and end detail sprues, gray. In this kit, those parts were black for the DT&I prototype, but I want them to have the same color basis as the rest of the model. Now the car body is ready to proceed with rivet application, which I will take up in the next post. In the first post about this topic, I described my approach to my “phase 1,” what I call the “mechanicals” of building a kit, and here is a link to that post: http://modelingthesp.blogspot.com/2014/12/building-resin-box-car.html . 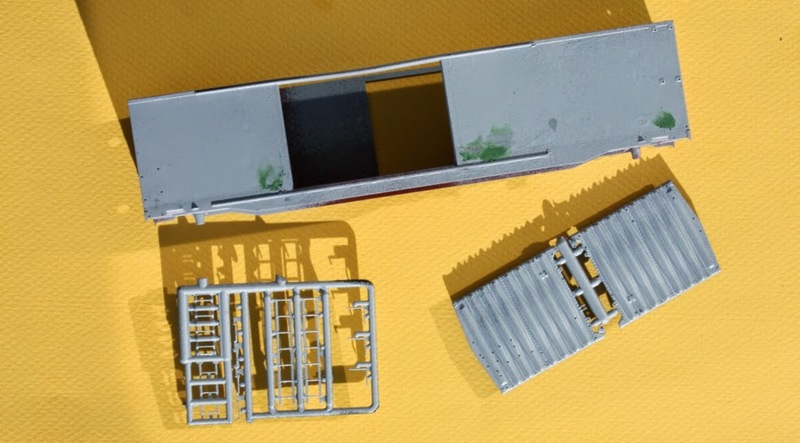 The second post described what I call the detailing, that is, the adding of all details that are applied to the kit, and that post can be found here: http://modelingthesp.blogspot.com/2014/12/building-resin-box-car-part-2.html . In this third and final post, I cover the painting, lettering and weathering of the car. The model here is still supported on my “interim truck support blocks.” Those were described in an earlier post, which you can find at this link: http://modelingthesp.blogspot.com/2014/11/interim-truck-support-blocks.html . The Speedwitch kit provides excellent decals for this car, and the same decals are available separately from Speedwitch. The lettering to be applied depends on era. To summarize what Ted Culotta said in his Essential Freight Cars article (no. 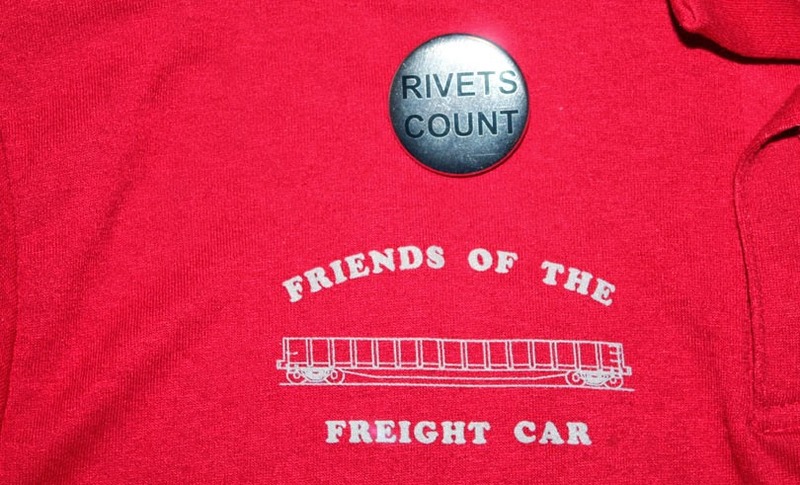 10), in Railroad Model Craftsman, February 2004: in the 1930s, the rectangular “Burlington Route” emblem was placed on the car door, but in 1937, that emblem was moved to the far left of the car side, and the new “Everywhere West” script slogan was placed on the door. Finally, in the early 1940s, the black background to the Burlington Route emblem was discontinued. Obviously I have omitted the “hundreds place” numbers, which in most cases were all that had to be changed after a reweigh. Next I complete all weathering, including the area shown above. For that process, I applied my usual acrylic wash methods. 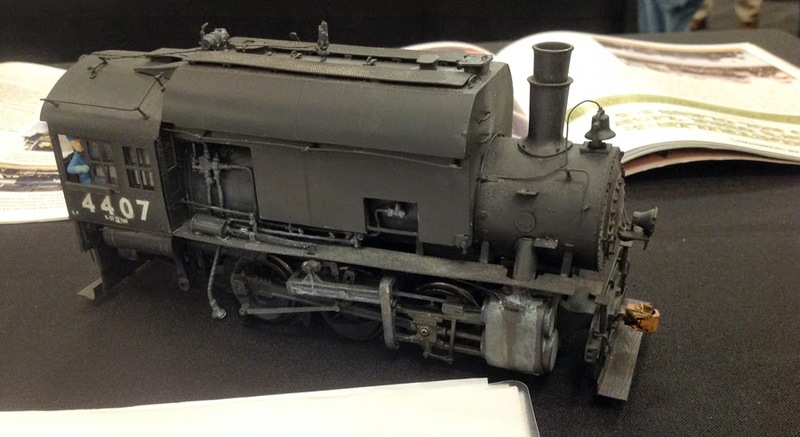 which are linked at: http://modelingthesp.blogspot.com/2014/11/a-summary-of-my-acrylic-weathering.html . Then a coat of clear flat protects the weathering, followed by Glosscoat (from the bottle, not the rattle can), applied with a brush, just in the area to receive the reweigh decals, along with the repack data at the far right of the car side. The area of the newly stenciled reweigh numbers (and station symbol and date) can be painted, or colored decal can be used. 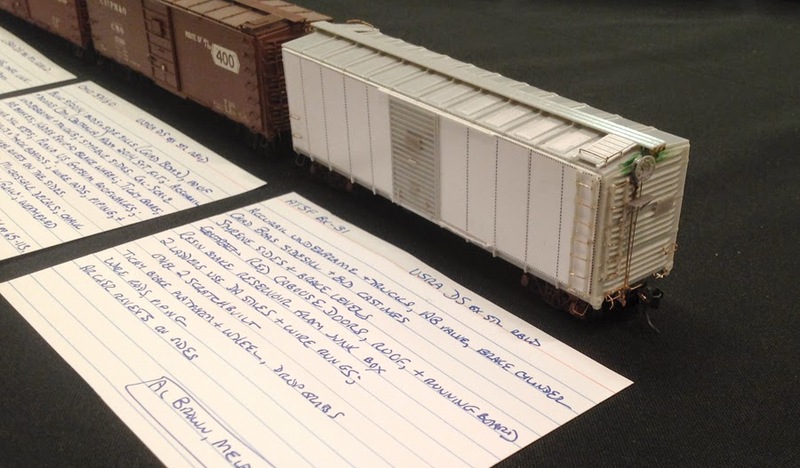 I often use the boxcar-red decal sheets once included in Sunshine Models decal sets for reweigh data. The color patch is sized to fit the decal elements remaining to be added. Note the added depth below the existing data. On these box cars, the reweigh station symbol was aligned beneath the capacity data, so that’s why I’ve provided that space here. To finish the model, I then added some chalk marks and route cards (explained in this post: http://modelingthesp.blogspot.com/2011/11/chalk-marks-and-route-cards.html ). Here is a photo of it. You can click on the image to enlarge it. As a one-piece body kit, this box car is not too difficult to build. A number of kits from Westerfield and Funaro & Camerlengo are also available in this form. If you have never tried to build a resin kit, one like this might be a good place to start. You can see that the road surface is slightly above the adjacent surface, and is matched to the height of the crossings. There are drainage ditches either side of the main line (at right) and there need to be culverts installed to carry water under the new road. 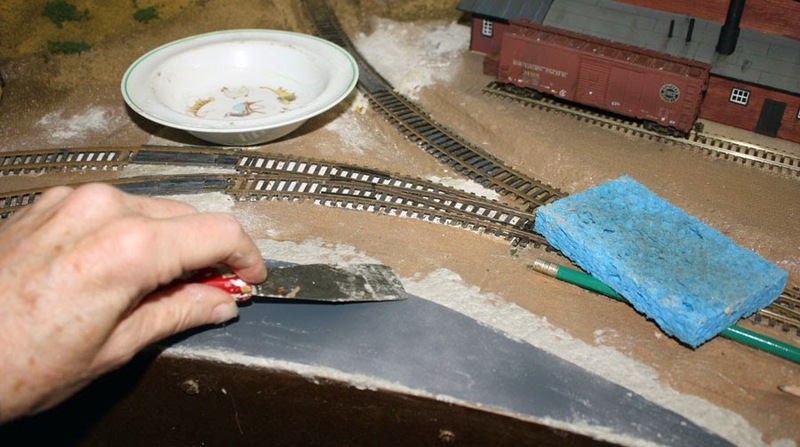 Model railroad layouts often neglect to provide drainage, but that is something the prototype is most careful and thorough about. Before refining further the road surface and contour, then, I added a suggestion of culverts, in the form of galvanized pipe at each place the road crossed the drainage ditch alongside the main line. I just use the large-size soda straws available at any fast food outlet, and paint them light gray. Modelers sometimes choose to paint such culverts a silver color, but galvanized surfaces like these only look silvery for a short time, once they are out in the elements. Before long they oxidize to a soft gray. The canopy glue used to attach the short snippets of drinking straw can be seen at left, with the remaining segment of drinking straw just in front of it. Road surfaces have been lightly smoothed with sandpaper. Although ground cover including dirt will have to be handled carefully around these culvert ends, this is not a difficult thing to manage. With these culvert representations in place, I could continue with road contour, right up to the point where this road has a junction with Pismo Dunes Road (about which I have previously posted; you can see that post at this link: http://modelingthesp.blogspot.com/2014/12/pismo-dunes-road-east-shumala.html ). I again used Brandt’s for this final coat, blending the culvert ends into the ground and also refining the road surface and shoulders (this is to be a dirt road). Pismo Dunes Road is at the photo bottom. I have left the roadway unpainted for this photo, so it is more evident, but the next step will be to paint it my basic brown ground color, followed by texturing. That will be covered in a future post.